Piano and Sax, originally uploaded by jumpnjoey16. This is a photo of the piano in the middle of Powerplant Mall in Rockwell. 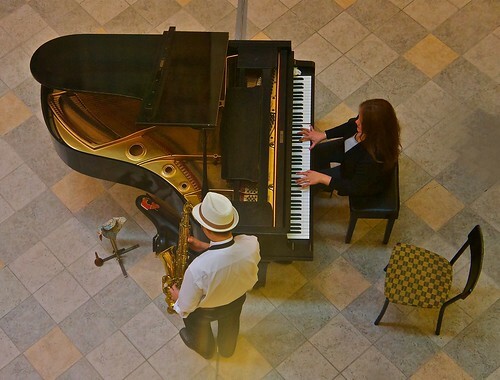 Today they feature a woman playing the piano and a man playing the saxophone. Yes - they had a duet - a duet that sounded nice. They were playing contemporary songs which I enjoyed listening to. As I watched them though, I think of the man who usually plays the piano. He is an old man and there's usually an old woman who watches him play. I'm not sure if they are husband and wife but I just know that he seems to make her happy. I wonder where the regular piano player is. I wonder where the old woman groupie is. I hope they're well.